Based on their experience in the design, development and quantity production of the Armoured Combat Vehicle (ACV) family of full-tracked Armoured Personnel Carriers (APCs) and variants, FNSS Savunma Sistemleri AS developed the Armoured Combat Vehicle - New Generation (ACV-NG). Development of this originally commenced as a private venture in response to a US Army requirement for a new vehicle to equip its Interim Brigade Combat Teams (IBCTs). Following US Army trials, FNSS Savunma Sistemleri has continued development under the name of the Armoured Combat Vehicle - Stretched (ACV-S). In addition to the original prototype used in the US Army trials, another two vehicles have been built to production standard. These are an infantry combat vehicle and anti-tank missile team carrier. Late in 2006 the company was awarded a contract from an undisclosed country in the Middle East for the supply of 10 ACV-S in a Tactical Command Post Vehicle (TCPV) configuration. They will be fitted with additional mine protection to meet STANAG 4569 2a, appliqué ballistic protection to meet STANAG 4569 3b and spall liners. Armament will consist of a roof-mounted .50 (12.7 mm) M2 HB machine gun in a protected mount. For its specialised role the TCPV will be fitted with an air conditioning system, positive pressure NBC system, data terminals, VHF, HF and UHF radios and an auxiliary power unit (APU) being fitted as standard. The latter will allow all of the on board equipment to be run with the main diesel engine switched off. To provide an additional working area, a tent can be rapidly erected at the rear of the vehicle. The hull of the ACV-S is of all-welded aluminium armour to which another layer of appliqué armour has been added, which provides protection against 14.5 mm armour-piercing attack and 155 mm artillery projectiles bursting overhead. FNSS Savunma Sistemleri also offers an additional armour kit that increases protection through the frontal arc against 30 mm attack. Increased protection is also available against anti-tank weapons with a HEAT warhead, as well as anti-tank mines. When compared to the original ACV, the ACV-S has a stretched hull with an additional road wheel either side, which gives a 30 per cent increase in internal volume. This allows the ACV-S to be used for a wider range of battlefield missions. The driver is seated at the front of the vehicle on the left side with the power pack to his right. The driver has a single-piece hatch cover that opens to the right and in front of this are day periscopes that give observation to the front and side of the vehicle. The middle one can be replaced by a passive night-vision design. 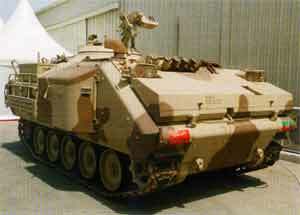 The roof-hatch arrangement depends on the version of the ACV-S. One version is fitted with a two-person turret armed with a stabilised 30 mm cannon with a 7.62 mm coaxial machine gun. As an alternative a 25 mm M242 cannon can be installed with a twin launcher for the Raytheon TOW ATGW (maximum range of 3,750 m) mounted on the left side of the turret. On this version the eight infantry are seated in the rear of the vehicle and enter and leave via the large power-operated ramp at the rear. These are seated four either side back to back. There is also a roof hatch above the troop compartment and firing ports with associated vision devices are provided in the rear troop compartment. The suspension is of the torsion bar type, with either side having six dual rubber-tyred road wheels with the drive sprocket at the front and idler at the rear. When compared to earlier vehicles the suspension has been upgraded with stronger torsion bars, greater road wheel travel and the front driving sprocket has been raised for greater obstacle climbing ability. This all contributes to increased cross-country mobility and a better ride for the crew. It is fully amphibious, propelled in the water by its tracks at a maximum speed of 6 km/h. Before entering the water the trim vane is erected at the front of the vehicle and the electrically operated bilge pumps are activated. Standard equipment includes an NBC system of the facemask or overpressure type and an air-conditioning system. Early in 2005 an ACV-S was shown fitted with the complete turret of the Russian BMP-3 infantry combat vehicle, which is used by a number of countries in the Middle East. This hybrid offers the firepower of the BMP-3 (it has the highest level of firepower of any vehicle in its class), while addressing the vehicle's main shortcomings. These are a very cramped infantry compartment and a difficult exit for the infantry, as the doors at the hull rear are so high off the ground. The two-person power-operated turret is armed with a 100 mm 2A70 rifled gun that in addition to firing conventional natures of ammunition can also fire a laser-guided projectile out to a maximum range of 5,000 m. Mounted coaxial with the 100 mm gun is a 30 mm MK44 cannon and 7.62 mm coaxial machine gun. 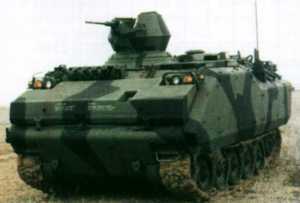 When fitted with the BMP-3 turret, the ACV-S retains its fully amphibious characteristics and is propelled in the water by its tracks at a speed of 4.8 km/h. It is being offered with a 430 or 530 hp diesel engine. It has a cross vehicle weight of 22.50 tonnes and in addition to its crew of three (commander, gunner and driver) can carry nine fully equipped troops. The anti-tank missile team carrier is armed with a roof-mounted .50 (12.7 mm) M2 HB machine gun and internally is fitted to carry the MBDA Eyrx anti-tank guided weapon (ATGW). This can also be used as an armoured personnel carrier. The TLC is essentially the ACV-S with the front part containing the driver on the left and power pack on the right, with additional space to the immediate rear for the vehicle commander and one additional crew member. First example of the TLC is armed with a .50 (12.7 mm) M2 HB machine gun on a pintle mount fitted to the commander's rotating hatch cover, but other armament options are available. Mounted at the front of the hull is a bank of eight electrically operated smoke grenade launchers that fire to the front of the vehicle. To the immediate rear of the crew compartment is a flatbed complete with tie-down points as well as drop sides and drop tailgate, which can be quickly removed if required. The TLC can carry a maximum payload of 6 tonnes and an HIAB 182R hydraulic crane is fitted on the roof of the crew compartment to assist in loading and unloading cargo. This can be operated by remote control up to 15 m away and can lift 1.6 tonnes at a reach of 3.26 m.
Unlike other members of the ACV and ACV-S, the new ACV-S TLC is not fully amphibious. Standard equipment includes the hydraulic crane, self-recovery winch, NBC system and an air-conditioning system. It is fully airportable in a Lockheed Martin C-130 Hercules transport aircraft. These include: 120 mm turret mounted mortar vehicle; non-turreted mortar vehicle (for example 81 mm or 120 mm); recovery vehicle; artillery forward-observation vehicle; command post with tent that can be extended to the rear; reconnaissance vehicle with 25 mm turret; ambulance; fitted with turret armed with 105 mm or 90 mm gun; flatbed fitted with various weapon systems such as air-defence missiles and surface-to-surface rockets; engineer vehicle; long-range anti-tank vehicle with guided missiles; and engineer support vehicle, complete with dozer blade. The flatbed version could also be fitted with an anti-tank mine dispensing system.